Have Gun, Will Travel have premiered their video for “Standing at the End of the World,” the first single from their forthcoming album, Fiction, Fact or Folktale? Scheduled for release on 10 September, you can pre-order Fiction, Fact or Folktale? 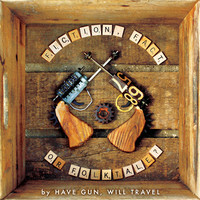 at Have Gun Will Travel’s Bandcamp page. Download “Standing at the End of the World” and watch the official video below. Fiction, Fact or Folktale? will be available through This Is American Music.